While it's much more difficult getting a baby and a toddler ready to go somewhere, I still try get out as often as I can. I find that toddler T is much happier to play with his toys or read books quietly with me as I feed his brother if we've gotten out at some point during the day. The best bit about living where we do in Brisbane is that we are close to so many libraries. I can take the boys to the rhyme time sessions almost any day of the week and they can sing and dance along. Maxi skirts make easy outfits for those kinds of days. I really liked this scarf and henley top together last time I wore them, so was eager to wear the combination again. It seemed perfect for the cold and foggy morning. By the time we got to the library, the fog had gone and Brisbane was experiencing a little winter heatwave. I took the scarf off and wished I'd worn short sleeves too! I really liked this outfit, just a little overdressed for the unexpected heat. Last worn: teal henley, wool skull scarf, chambray maxi skirt, Converse, Rebecca Minkoff silver mini MAC. Other ways to wear: teal henley and a baby bump, skull scarf and stripes, chambray maxi skirt with purple, Converse and jeans, Rebecca Minkoff silver mini MAC and denim shorts. 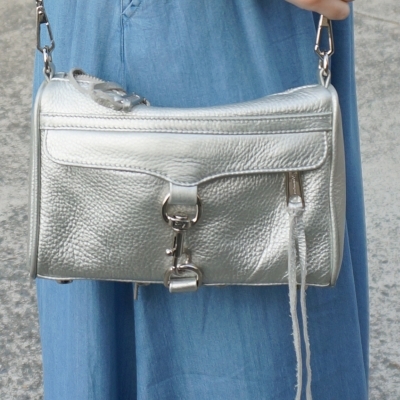 Another maxi skirt, another Rebecca Minkoff bag. I do tend to cycle through a few favourites in my wardrobe! While I am trying to wear more of what I own, I have combinations I keep coming back to. When trying to get two little ones ready each morning I often don't get a chance to think very long about what I want to wear and so reach for the familiar. Maxi skirts go with everything and this top, although not a nursing top, is so easy to breastfeed in so this was the perfect outfit for a morning at the library rhymes session and catching up with a friend. Just like the outfit above, the scarf didn't stay on too long during the day. 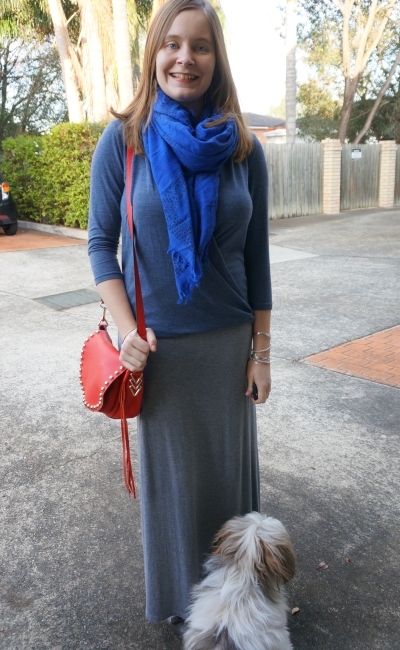 Last worn: cobalt scarf, wrap top, jersey maxi skirt, silver ballet flats, Rebecca Minkoff saddle bag. Other ways to wear: cobalt scarf and stripes, wrap top and chambray, jersey maxi skirt and a graphic tee, silver ballet flats and skinny jeans, Rebecca Minkoff saddle bag and a printed tank. Linking up with Hello Monday, Modest Monday, Mums That Slay, Mix It Monday, Classy Monday, On Trend, Turning Heads, Confident Twosday, Wardrobe Wednesday, Midweek Inspo, What I Wore, Fresh Fashion, Oh Hey Girl, Throwback Thursday, Fashion Files, Fabulous Friday, Weekend Linkup, Fun Fashion, Weekend Wear. I love the way you've styled your maxi skirts for the cooler weather, Mica. I tend to relegate maxi skirts just to summer and only wear them one way. loving your color combo! the cute scarf is making me excited for fall time! I find it so hard to style maxi dresses, particularly in winter and with longer tops, but you pull it off so well!! I really like both of these outfits...maxi skirts and scarves...that's my kind of girl! love how you paired similar tones in the first one, blue and green work well together. In the second outfit I really liked the pop of colour with the red bag. Having libraries close to you must be good, since I don't have any close to me, I can't remember when was the last time I went to one. Also I'm sure toddler T is enjoying the dancing and singing sessions :) First outfit is my favourite, that scarf and top together looks beautiful! I loved trips to the library when I was little! 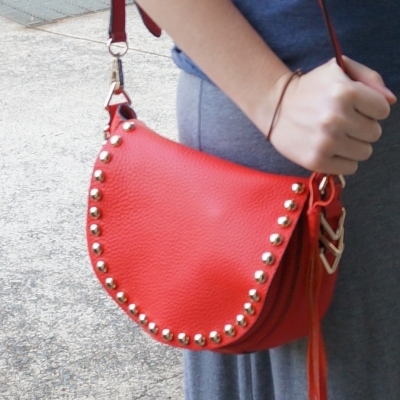 Your bags are so fun in this post as usual! I imagine it's hard, but I LOVE that you still make an effort and get ready and take the boys out. I have no idea how people stay cooped up all day in their house and never do anything with their kiddos. By taking them out, you're setting them up socially for the future. Plus, even with two young boys, you still look like a rock star! haha thank you! It's hard, and we don't always get there on time, but it's easier on us all if we've done something in the morning - otherwise the toddler just has too much energy, hehe! I was just commenting on another blog how managed to pull together your pregnancy looks with maxis and how they worked so well... and I see you continue doing that. How amazing that you have many libraries nearby... I think I don't even have ONE. Third world. We are definitely lucky to have access to so many libraries. I am really loving both of these looks, especially the first one--I think it's the color combination, I just LOVE how pretty it is!! I'm going to keep that in mind for when I have two. I'll be working from home 2 days a week but I still hope to get out of the house some when the weather agrees--staying cooped up too much with two little ones sounds daunting!! Yes I find it much easier for the rest of the day if we've been out in the morning. It can lead to some hectic mornings though, ha! That's awesome that you live so close to so many libraries! Both scarves look so pretty with your looks :) I love the cobalt shade of the second one. Maxi's are the best! So easy to wear and so comfy too! I can only imagine how hard it must be to get two little ones ready each morning, including yourself, I give you a lot of props b/c you always look so fab and stylish! I think it's truly important to ensure that you look and feel great when pregnant and after, it really does help to enhance self-confidence and you're in a much better mood, I'd assume. That said, regardless if you have time to contemplate your looks, you create such lovely and practical pairings. I love both the looks you've shared here! I hope you're having a great start to your week so far, beauty! Taking the kids out is so important! Otherwise you can´t keep them still for more than one minute. Both outfits look great - love the purses! Beautiful!! I love the dresses! You're lucky to live so close to the library that does rhyming, ours is about 25 minutes drive away. We live close to the school though so that's a blessing but now that it's Summer holiday, it's tough! This outfit looks gorgeous on you girl, I am loving the maxi skirt! I've never seen a chambray maxi skirt...how cool! I use to love going to libraries as a child! The events they had were so much fun. It brought back memories, when you said you take your two boys. I know they enjoy it. Love the mix of blue in the first outfit Mica. So pretty! Very smart of you to layer. Winters don't seem as cold anymore. The weather is often fickle. So removing layers is smart. Your Rebecca Minkoff collection is killer, lady! Such a cute look - I'm loving the scarf addition especially! I like the blue/green thing you have going on with the first look! I also have found that even with one my day is smoother if I have got my little one out of the house at least once during the day even if its just for an hour. I love the maxi skirt! The colour blue really suits you! I love the pop of red with your bag in the second outfit! It's so important to get out of the house when you can. It makes you feel so accomplished for the day! I love all of the colors of blue! Totally recycling looks a bit lately, which is not helpful for Instagram, hahaha!! #stylebloggerproblems. Glad you've had warmer weather, we have some to look forward to next week apparently! Loving the colours and scarfs mixed together - you look wonderful! You're looking great! Can't even imagine, how you can get ready with 2 little ones! Love the little touch of red on the second look! Maxi skirts with a long sleeve top & a pretty scarf are great for winter! And I LOVE your red Rebecca Minkoff bag!!!! Love all the blue hues Mica! Very pretty maxi and love the silver with it,, a favorite combination. You know I love RM and that red pops! Love the little pup getting in their too! You have the best collection of maxi skirts and always love how you wear them. Beautiful in shades of blue! Thanks so much for sharing with Fun Fashion Friday and have a wonderful weekend! These are such pretty color combos! You always give me maxi skirt inspiration! A maxi is such a great all season piece! Fashion skirts are very mamas bff! Loving your red handbag!! You always style your maxi skirts so well! I really like the color palettes of each of these looks.